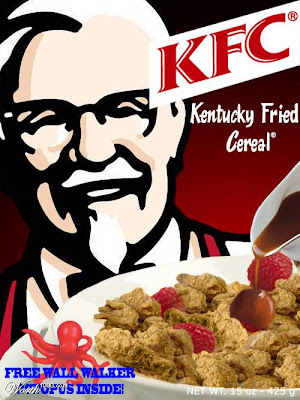 With the advent of their new cereal, KFC comes on board with Your Lighter Side to promote healthier breakfast choices. Thanks to KFC and parent company Yumm brand foods (owner of restaurants like Burger King and Pizza Hut), healthier choices are on the way for consumers concerned with insulin-spiking cereals. Similarly, Burger King is following suit with breakfast burger pastries, soon to be found in frozen food aisles across the country. I saw the headline in my news feed, and ALMOST believed it. Nice one. For a moment I really thought you'd lost your marbles. But now I understand 🙂 Nice one. Hahahahaha! I had to keep looking at the box to realize the cereal bits were chicken. Ha! Jaime, you kill me. Haha – nearly got me there! Happy April Fools to you too!! I believed this for a few moments. Stranger things have happened. you seriously got me. i thought you had lost it! but alas, me again…. LOL! I LOVE April Fools Days. Sniffle. You mean I don't get a free walker octopus?